But now it’s Monday – the favorite day of resolution-makers – so I need to get back on track before I have to buy a whole new wardrobe. However, as I’ve mentioned before, I struggle with healthy eating when Erik’s gone. 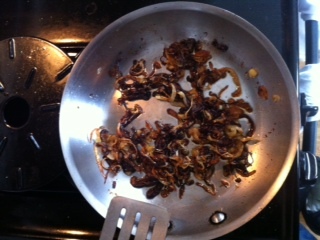 It’s got to be super tasty, easy to cook, require minimal clean-up, and reheat well or I just won’t do it. 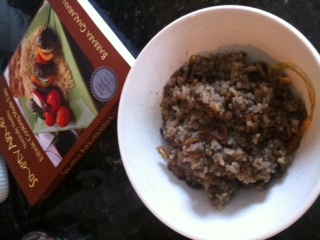 Luckily, I ordered delivery from a Middle Eastern restaurant last week and remembered how awesome mujaddarah is – a delicious, simple, two-pot, perfect-for-leftovers rice and lentils dish. You won’t believe me until you try it, but the final meal is so much more than the ingredients imply. Somehow, sauteing thin onion slices in a pool of olive oil until they’re brown and crispy adds an incredible amount of flavor to rice and lentils. It’s earthy and satisfying and totally not guilt-inducing. This makes a great lunch or dinner – add a salad or sauteed greens if you want some veggies. My FAVORITE way to eat this, though, is topped with scrambled eggs and a drizzle of sriracha or plop of yogurt. Yum yum yum!! Pick through the lentils to remove debris. Sometimes little rocks and sticks hide, which aren’t fun to chew on. Rinse them well. Add the lentils and 3 cups of water to a pot, cover, and bring to a boil over high heat. Reduce the heat so that the water simmers gently for 20 minutes. Rinse the rice well and let it drain while the lentils cook. 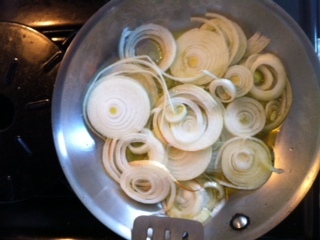 While the lentils are cooking, slice the onions into thin rings. 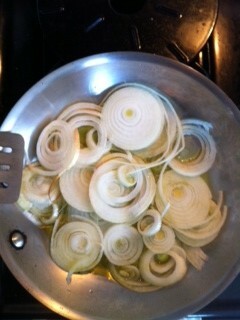 Heat the olive oil in a skillet (not non-stick) over medium heat and add the onions. Stir them every now and then until they’re dark brown. It should take about as long as the rice and lentils. 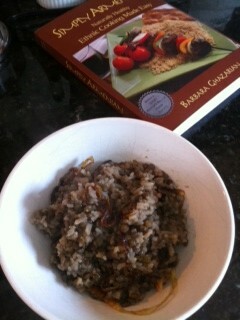 Add the cooked onions and salt to the lentils and rice. 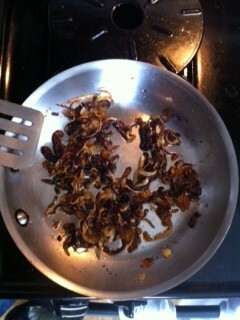 Pour in any oil that’s left in the skillet, because it’s tasty. Mix well and serve hot, warm, or cold.